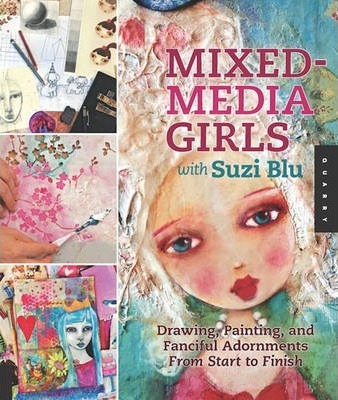 Mixed-Media Girls with Suzi Blu takes you step-by-step through the process of how to draw folk art and stylized girls' faces. With inspiration from Suzi's popular online workshops and videos, this inspiring book teaches you to create simple, balanced features and add shading with colored pencils and paint. From there, you'll discover how to draw the rest of the figure and put it into a complicated, textured, mixed media/ waxed background. After learning to design costumes and personalities for your girls and adapt them to fit your own personal style, you'll create vivid, exciting, backgrounds by layering paint, collaging with fabric, carving beeswax, distressing wood, and building up texture with mediums and pastes. Extensive examples and close ups of work will inspire you to take your art to the next level. Known for her quirky videos and down to earth style, Suzi Blu is a leader in teaching art to women all over the world through her online school Les Petit Academy. She lives in a gypsy cottage in San Diego, California with her best pet friends Gigi Rainbow Sparkle and Finnegan Glitter Sunshine Magic. She encourages everyone to be an artist.